Happy Monday! 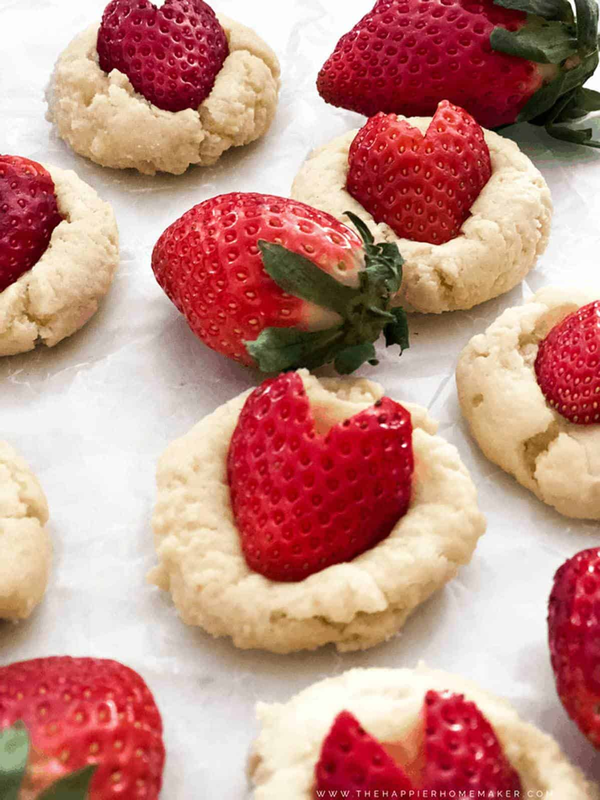 I have the cutest little cookie recipe for you today-Strawberry Cheesecake Cookies! I wanted to make these cookies because I was inspired by a recipe that I shared a whopping five years ago-Strawberry Cheesecake Bites. I decided to alter the recipe just a tad to give them more of a cookie texture but they still have all the delicious flavor and creaminess of cheesecake! It’s funny because in my original recipe I talk about my then 4 year old and how he’s obsessed with strawberries, and he still is now at nine! In fact, I had three pints just sitting in my fridge because he goes through them so quickly! These cookies are not hard to make but there are a few notes for the result to come out good. Start with room temperature butter and cream cheese (neufachel is okay too) and whip it for at least two minutes so it’s extremely light and fluffy. 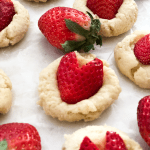 Add the strawberries immediately while cookies are still very soft. Do not place dough on a hot pan, alternate cookie sheets or wait until the pan is cool between batches. 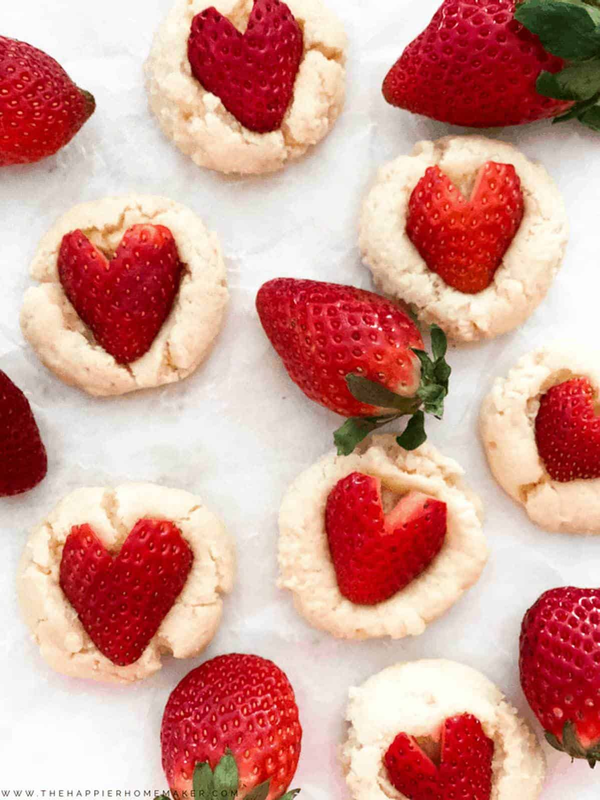 Strawberry Cheesecake Cookie Recipe – Easy, delicious light and fluffy cookies with a creamy center, topped with a heart-shaped strawberry. Perfect Valentine’s Day dessert recipe! In a mixer combine cream cheese and butter and beat on medium-high speed at least two minutes until light and fluffy. Reduce mixer speed and add in sugar, lemon juice, then eggs one at a time and mix until uniform. Remove bowl from mixer and slowly add flour a little at a time and stir by hand until just blended, do not overmix. Refrigerate at least two hours or overnight (covered). Preheat oven to 350 degrees Fahrenheit. Line a baking sheet with a baking mat or parchment paper. Use a cookie dough scoop to measure out 1″ balls of dough. Roll in your hands and place on the prepared baking sheet. Flatten balls slightly with your hand or the back of a spoon. Bake for ten minutes. In the meantime, cut off top of strawberries, halve them, then notch the top into a heart shape if desired. Remove baking sheet from oven and immediately press strawberry halves into the top. Remove from pan to cooling rack and allow to cool ten minutes. I hope you love these as much as our family did, I think they are just adorable for Valentine’s Day! Let me know what you think in the comments below!